The answer is an unequivocal “No!” Forgiveness does not require us to continue to put ourselves in harm’s way, whether that harm is emotional, mental, spiritual, or physical abuse. Unrestrained anger is abuse. I think if we could understand that concept and truly believe it, we would change the way we act on our anger. Again, anger itself is not sinful. God’s anger is mentioned over 450 times in scripture, and yet He has never sinned. It is only when we choose to behave inappropriately in our anger that we are guilty of sin. It is often the offender who expects, once he has been forgiven, that everything will immediately return to normal, as if nothing had ever happened. He feels free to behave, once again, however he pleases, often repeating the same offense and expecting, once again, to be forgiven. The mistake he makes is that he doesn’t understand repentance, which is to turn around and walk the other way. It is completely forsaking the behavior that hurts or offends others. We want forgiveness, but we also want not to have to change. The other person, after all, needs to accept us just the way we are, and simply keep on forgiving us. That’s asking an awful lot from those who are expected to tolerate being hurt, betrayed, deceived, over and over again. At some point, we need to establish uncrossable boundaries with strong consequences. Remember that forgiveness is simply giving up one’s right to demand justice. It is not an acceptance of continued mistreatment. Proverbs 29:1. “He, that being often reproved hardeneth his neck, shall suddenly be destroyed, and that without remedy.” There comes a time when even God Himself will no longer strive with a man who has a stiff, unyielding, hard spirit. I don’t know when that moment comes, but I do know that once he has crossed the line too often, he will not have another chance with God. Those who abuse others in their anger have stiff, hard, unyielding spirits. They have no compassion for those they hurt; their only concern is getting their own way. They justify their tantrums, feeling entitled to throw fits whenever they feel they’re not being treated according to their own overblown self-regard. I often tell my clients that you simply cannot reason with an unreasonable person. Instead of talk, sometimes there needs to be action. It would be wonderful if all parents would teach their toddlers than tantrums are not acceptable and that they must learn to control themselves. Sadly, too many parents are intimidated by the anger of a strong-willed child. They placate him, giving in to his rage, creating a potential monster who will continue to use his rage as a weapon as long as it gets him what he wants. And don’t forget, there are all kinds of tantrums. A silent, pouting tantrum is just as much a tantrum as a raging, screaming fit. Women who are abused by a man who will not control his rage, but uses it instead to control her, must decide at some point that she has had enough. No matter how often he says he’s sorry and will never do it again, he usually does repeat the behavior. No woman is required to stay in harm’s way. She doesn’t have to divorce him, if that is not an option in her beliefs, but she doesn’t have to live with him, either. Other kinds of abusive situations include a child in the family who uses his temper to control everyone else. Isolation is the best bet for this child, especially when he is small and easily controlled physically. Typically, when the audience leaves, the show stops. There’s no fun in throwing a tantrum when no one is there to witness it. It is true that we are to forgive “seventy times seven.” That is, every time the memory recurs, we are to forgive and let go of our desire to demand justice. However, that seventy times seven does not mean that we must endure someone’s angry rage 490 times. We are responsible for our behaviors, and we need to be held accountable when we cross a line. God never gave anyone the right to continue angry, abusive behavior simply because the victim has forgiven him. I John 1:9 says that when we confess our sins, He forgives us and cleanses us from all unrighteousness. Being cleansed would indicate a change in direction, a different mindset and a different behavior. If those things do not happen, then we can only infer that there has not been true repentance. I may forgive you for ongoing rotten behavior. That doesn’t mean I’m going to stick around and continue to endure it. Forgiveness is not permission for you to keep on mistreating me. One of the primary causes for chronic, bitter anger is simply a lack of forgiveness. This is a topic I address very often in my office. Unforgiven hurt or offense creates the poor-me state of mind; that leads to bitterness, and bitterness often ends in serious depression. It’s a dark and gloomy place to live, and no one wants to go there with you. Angry, bitter people are lonely people. Negative, critical, angry, bitter–it all goes together and often starts with a sense of not getting what a person feels entitled to, whether in material possessions or emotional satisfaction. We are all creatures of appetite. When that appetite, whatever it craves, is not satisfied, we are angry. Unforgiving anger is toxic. Forgiveness is a primary teaching of Jesus. Matthew 6:12, a verse in what we often call The Lord’s Prayer, teaches us to ask God for forgiveness in the same way in which we forgive those who have hurt us. Stop a minute and consider: Do you really want God to forgive you the same way you forgive others? Or do you have some work to do in that area before you can safely ask God for forgiveness? 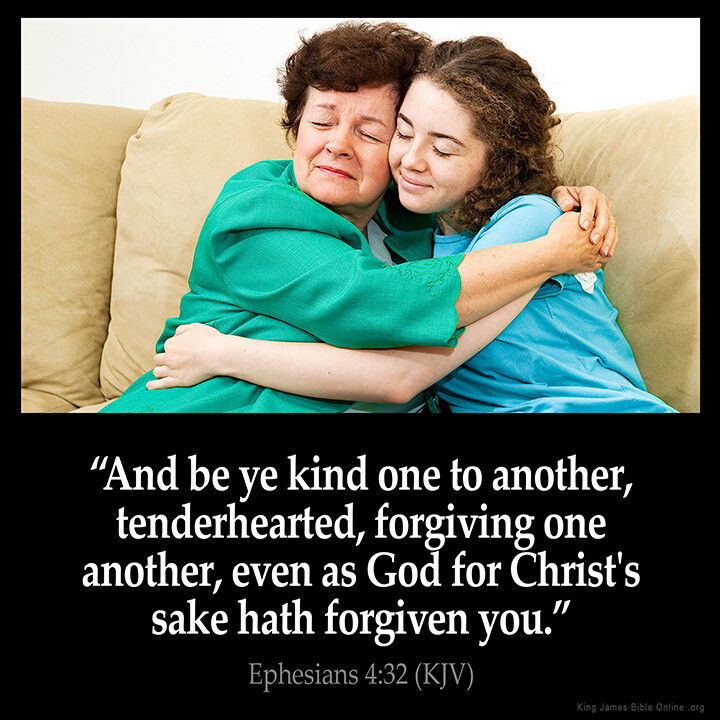 Verses 14 and 15 in the same chapter teach us that God can forgive us when we forgive others; however, He cannot forgive us when we withhold forgiveness from others. This is such an important issue! We forgive others not for their sake, but for our own. It is only through forgiving that we release ourselves from the prison of bitterness and hatred. When we do not forgive, the person who hurt us continues to control our emotions and our behavior, even over time and distance. And the irony is that the offender is rarely aware of this terrible power he has over us because he is not still stuck in the moment in which the offense occurred. First, that really isn’t your problem. Your problem is that you have allowed previous hurt to continue to influence every moment of your life. Second, the person who harmed you is answerable to God. Never think for a moment that your desire to “get even” is more powerful than God’s ability to deal with sin. Let it be. It’s killing you, not the person who hurt you! So what, exactly, is forgiveness? Okay, that’s amusing, but there’s also a good principle involved. Forgiveness, in it’s original meaning, was to choose to erase a debt. It was to wipe out the debt and all its details, to mark it as “paid in full” even when the debtor was completely unable to pay. Sometimes, we just need to learn to swallow. Jesus paid our debt in full when He sacrificed His life at Calvary. His blood was the payment; His suffering and death absolved me of the debt of my sin. His triumphant victory over sin and death makes my release from the prison of anger and bitterness a reality when I accept His salvation, His forgiveness, and His unending love. As I develop the character of Christ in my walk with Him, forgiveness becomes a part of my thinking, behavior and emotions. It frees me of the need for vengeance. It makes it possible for me to walk in light and to enjoy loving others, because I no longer need to establish my own prominence. I found an emoticon of a bitter person that was perfect for this post, but then I lost it and can’t find it again. It was the yellow “smiley,” but not smiling. The face was angry, with the mouth open and tongue flapping. On its head was a little golden crown. Do you get it? One of the reasons we’re often angry is because we see ourselves as the king or queen, and we didn’t get our way–which, of course, we are entitled to get! So bitterness sets in. Forgiveness. There are some parallels I use in counseling that I find very helpful:Three things forgiveness is not, three things forgiveness is. 1. Forgiveness is NOT just saying, “Oh, it’s ok, don’t worry about it.” It is not okay when someone hurts you. It is not okay when someone behaves abominably toward you, and it should never be brushed under a rug. However, sometimes the offender never apologizes. You can’t wait for it, because if it never happens and you never forgive, then you are the one who will suffer. 2. Forgiveness is not an event. It is not once and done. Only God has the infinite ability to forget our sin when we confess and repent. We, unfortunately, seem to have an infinite ability to remember wrongs done against us. Forgiveness is a process. It is ongoing, repeatedly choosing to release the debt. When Peter asked Jesus, “Lord, how many times should we forgive? Seven times?” Jesus’ response was, “No, Peter. Seventy times seven.” Seven is the number of perfection and infinity in the Bible. Our forgiving others must be ongoing, repeated infinitely. The wonderful thing I’ve learned over the years is that the more often you forgive, in the beginning of this process, the less often you have to deal with it as times goes on. 3. Forgiveness is NOT a feeling. If you wait until you feel like forgiving, you’ll never do it. Emotions change on a dime. We can’t ever rely on our hearts to tell us when to forgive. Jeremiah 17:9 tells us that our hearts are deceitful above all things, and desperately wicked. How can I rely on my sinful heart to guide my behavior? Next week, we’ll talk about what forgiveness means in situations of abusive behaviors. Stay tuned. Well, anyway. I closed last week’s post by saying that anger can most certainly be controlled. We do not have to be the victims of our anger. I need to clarify that I’m talking about a normal person who has no underlying medical or mental health problems. There are some conditions that exacerbate anger. If you are dealing with a truly uncontrollable anger, then you need to get to a medical doctor and/or a biblical counselor, post haste. Don’t wait another minute. In the meantime, those of us who just think we have the right to throw a temper fit whenever we want to need to understand what’s really going on. First, I want to remind you of the personality study I’ve mentioned before. There are four different temperaments, and each of them shows and processes anger differently. 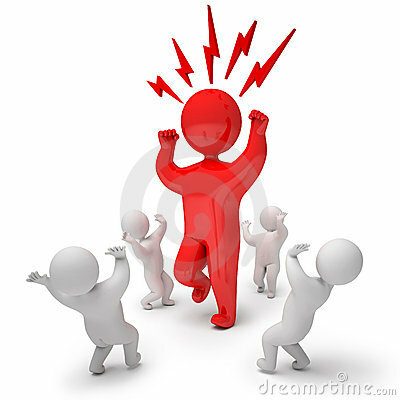 The choleric leader “get it done” person is capable of furious rage, and he can keep it going as long as he feels necessary to get the results he wants. He’s intimidating. The sanguine people-person, who loves attention and praise, has an explosive but short-lived temper. He forgives easily. The melacholy “get it right” person has a quiet, cold, removed anger with which he punishes people until he gets the desired results. The phlegmatic “get along” person is rarely obviously angry. He, too, clams up. His anger tends to land in the passive-aggressive category. He just quietly resists until those who must deal with him throw up their hands in frustration and leave him alone. Whichever mode you recognize in yourself, please also recognize that uncontrolled anger is simply a temper fit that you have decided to throw (and yes, clamming up and refusing to talk is a temper fit). How, you may ask, can I make such a blunt statement? Well, let me see if I can answer it a couple of different ways. Now and then, a man will come to my office and tell me he was sent to counseling for “anger issues.” (Are you as tired of “issues” as I am?) So I begin to interview him, and I discover, almost 100% of the time, that his anger is allowed full roar ONLY at home. He keeps it contained everywhere else. Now, keep in mind that this guy has told me he can’t help it; that he just loses control and doesn’t even know what he’s doing; that people just need to quit annoying him. When I quietly, in a gentle tone, point out to him that he seems able to control his anger when he knows he has to, he will go red in the face, his eyes will change, and I’m wondering if I need to make a quick exit. Amazingly, though, he reins it in and tries to argue with me. I have to be very confident, firm, and unmoveable in my position that he chooses when to allow his anger to explode; and that he generally chooses for it to explode on his wife/family. Once we get over that hurdle, we can begin to figure out exactly why he’s so angry, and gives his anger free rein at home. Working with the cold, silent anger of the melancholy and the phlegmatic is more difficult. They won’t admit they’re angry. They refuse to acknowledge that their silence is a control tactic, seeing it instead as a way to avoid unpleasant confrontation. These folks truly hate unpleasant confrontation, and they see their withdrawal as a way to calm things down. They don’t like to admit that they’re angry because they tend to see anger as sinful, and they’re perfectionists. It’s very hard for them to admit they’re not perfect. So it takes a lot more patience on my part, a lot more digging, to help them understand why they’re so miserable and why people tend to avoid them. Can you imagine how difficult this whole process is for a hot-tempered, my-way-or-the-highway choleric/sanguine?I am quick to jump on bandwagons, to fight like a tiger for what I believe. Keeping all that under the control of the Holy Spirit is an ongoing process. I’m thankful to say that I don’t remember the last time I threw a wall-eyed hizzy fit. I do know that the potential is there, and that it is my responsibility to stay filled with the Spirit. Next time, we’ll look at some specific causes of anger, and what to do about them. The pictures really aren’t that funny, are they? We talk about someone who “blows his top,” but when you think about it, that’s kind of what happens when someone allows himself to be so angry that he actually has a stroke! Yes, it has happened! I was looking for some pictures of real people who were having a fit of anger, but they were so ugly and upsetting that I decided to go the cartoon route instead. Too bad we can’t do that with the people in our lives who are angry all the time–just relegate them to cartoon status! Anger is a serious concern for those who live with angry people. The entire household is controlled by the specter of that person’s anger: “Whatever you do, don’t make Dad/Mom/Jimmy/Susie/the dog/the cat MAD!” Trouble is, it takes very little to trip that trigger, and sometimes we do it completely without planning for the volcanic eruption that follows. There’s a lot to say about anger, and for the next several weeks we’ll look into what it is to BE an angry person; what it’s like to live with one; what causes furious anger; and what can be done about it. Today, I want to point out that anger, in and of itself, is not sin. Are you shocked? Well, consider this: God’s anger is mentioned over 450 times throughout the Bible; God is without sin. So what’s the problem? I can just go ahead and throw a fit, and that’s ok? Well, no. It’s not the anger that is sin. It’s the fit. I heard someone refer to it as a “wall-eyed hizzy fit” years ago, and that picture has stayed with me. No one else should be expected to endure your fit of unmitigated rage. If you really need to throw such a fit, go outdoors–preferably in a torrential downpour–and throw your fit where others don’t have to endure it. You’ll cool down pretty quickly if there’s no audience. We actually should be angry about some things. I’m angry about pedophiles, abortionists, thieves, murderers, and corrupt politicians. I’m angry with people in spiritual leadership who abuse their power, behaving in ways that no man of God should even think about. What I want to point out here is that it is not appointed to me or to anyone but God to deal with this kind of evil. My anger is justifiable; to take vengeance into my own hands is not. I am not allowed to torture pedophiles for the damage they do. I am not allowed to shoot abortionists. I am not allowed to cut off the hands of thieves, or to remove the tongues of liars. Too bad we can’t do some tarring and feathering of the corrupt politicians, isn’t it? But really, if we start that sort of vigilantism, it will only increase the decline of our society. We can–and should–vote them out of office; we can prosecute crimes and put perpetrators away for a long, long time. But we can’t just go out and wreak havoc because we are angry. Very few of us do, you know. Which brings me to an important point that I will talk about next week: We can control our anger when we know we have to. Angry outbursts and temper fits are choices we make. We’re lying when we say, “I just can’t help it.” Yes, we can.